In Buddhism, philosophy must always be joined with practice, experience and realization. The Buddha Path, written by Dzogchen Khenpo Choga Rinpoche, is a concise compendium in the form of a practice manual of the entire vast range of teachings contained within the Dzogchen Lineage of Buddhism. The Buddha Path is the main practice text used daily by all English speaking Sanghas within the Dzogchen Shri Singha International organization. It is in the process of being translated into many other languages. View full-page images from the individual chapters of The Buddha Path, and read below the preface from The Buddha Path describing its contents and the remarkable way it was composed. 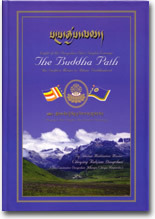 The Second Edition of The Buddha Path is now available for purchase online. For those of us who have had the opportunity to practice using the previous edition of The Buddha Path, the book itself, the Buddhadharma, and our teacher, H.E. Dzogchen Khenpo Choga Rinpoche, have become inseparable. If this is your first time to encounter this book, its practices, or its author, then this preface must be a preface not only to a new edition of The Buddha Path but to the experience of using this book and the results which follow. Inasmuch as these practices have been established in our minds, they have immensely benefited our lives, and it is from this perspective that we address you with confidence and joy as fellow students. Regarding the content of the teachings, it is with the assurance and seal of the author that the teachings contained in this book do not deviate from those of the authentic Dzogchen Lineage and that this is true in every degree of detail. Buddhist teachings are designed to benefit sentient beings, with different types of teachings, like different types of medicine, designed and intended for students of different Karmas, capacities, and situations. The overall structure of this book reflects the stages or sections of the Buddha’s teachings designated for students of different Dharma senses. Each section of the book corresponds to a specific major section of the Buddha’s teaching, and presents the authentic view and practice of that section. The Buddha Path then reflects the limitless treasury of the Buddhadharma and the unity of all teachings within Dzogchen, and at the same time offers the individual concise methods to incorporate specific teachings into practice and life. 1) Memory of Dharma training from past lives. 2) Receipt of the blessings of Padmasambhava during the course of his meditation practice. 3) Receipt of the blessings and transmissions of the Dzogchen Lineage Masters, along with the degree of “Khenpo,” or professor, from the Dzogchen Shri Singha Five Sciences University of Tibet. 4) Meditation experience, in particular a total of seven years of solitary meditation undertaken in caves in the high snowy mountains of Tibet. 5) Over twenty years of practical experience teaching the Dharma and working with thousands of students in over forty countries around the world. The Buddha Path was written by Dzogchen Khenpo Choga Rinpoche, and contains primarily prayers and instructions composed by himself. It also contains certain aspirations and mantras taken directly from the original Sutra, Tantra and Dzogchen teachings of the Buddha, translated or transcribed here, and inserted in the appropriate location of this text by the author. In addition, hundreds of Buddhist students around the world have contributed to bringing this edition of The Buddha Path to fruition. Many of Rinpoche’s students who have participated in the editing of this holy text can recall late nights when Rinpoche and a group of us would work on this book, plumbing the text, reading it, reciting it and examining it word by word. These editing sessions were undertaken by groups ranging from three to dozens of students over a period of several years and in many venues around the world, including Dzogchen Shri Singha Dharma centers, private homes and public places. Often these sessions were inspired by Rinpoche’s announcement that a new section of the book needed to be written or new lines included in an existing section. Usually, Rinpoche would spontaneously reveal the new text in the form of a complete block of excellent and poetic language, which we had only to transcribe verbatim. At other times, the new addition required that the surrounding sections of the text be revised in some way, and this then became the subject of the editing work at hand. This process of group teaching and text composition was repeated again and again with different student groups in different parts of the world where Rinpoche traveled and taught. At each stage, the current version of The Buddha Path would be sent out again, and many people near and far would be assigned to read the whole text, use it in group practice, and provide comments via Internet or telephone. This information would then be drawn into the process of subsequent editing and revision. This is the special experience of those of us who have been fortunate enough to have been involved in the creation of this text, reflecting how the words of the teacher, the words on the page, the passage of time, and our experience as a Sangha were made inseparable through the vehicle of this book. Now, turning to the benefits of the book itself, they are these: Through the knowledge and blessings of The Buddha Path, you will awaken wisdom and attain true freedom. Taken to heart, these practices will lead you to an indestructible inner peace composed of wisdom and compassion and a life of love and joy. Generating pure aspiration and unconditional love, you will be able to extend healing blessings and absolute peace to the entire world. Finally, it is the sincere aspiration of Dzogchen Khenpo Choga Rinpoche and of ourselves, the entire International Dzogchen Shri Singha Dharma Community, to share these sacred peaceful teachings, to increase the loving kindness in all minds, and to maintain the Dzogchen Shri Singha Dharma Lineage, by which the teachings have come to us. This lineage is an unbroken chain of Buddha blessings which we pray shall always be inseparable from ourselves and all beings. Many practitioners worldwide have already received the blessings of the previous edition of this text, and we pray that through our efforts and aspirations more will receive such blessings in the future. May all sentient beings who see, hear, touch, practice, or otherwise contact this holy text swiftly attain Enlightenment. For more information about "The Buddha Path,"